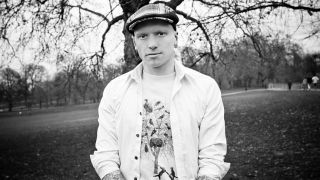 "You've got to put yourself in the listener's shoes and make it an experience"
Dave McPherson, lead singer and guitarist of Essex alt-rockers InMe, is a busy man. I´ve kind of reached a thing now that while InMe is doing an album campaign, it´s time to work on a solo album and vice versa. I really started working on it around when we were in this delightful caravan touring around Europe. I had hours and hours of time in the back to work on the orchestral side of things and arrangements. I´ve been using my phone really, while I´m travelling. If an idea pops into my head, a lyric or a melody or anything, I put it in there. I immediately started to get an idea of what I wanted the album to sound like - a bit over the top and dreamy. I think I was out on that tour when I came up with the title as well, Dreamoirs. The first album was called The Hardship Diaries, so it kind of carried on that idea of a musical journal. I worked on it intensely for about a year. Most of it is fresh stuff, although there´s one song on there that was written in 2004. How did you record the album? I started in July, working with Mike Curtis - he also did The Hardship Diaries and the last InMe album - and it was a ten-day session. I recorded everything myself, did the drums in three days, did the guitars, the vocals and then the bass last. Then we left it for about six months then came back and did all the backing vocals. We mastered it the day before launching the Pledge campaign, so just in time. So you played everything on there? Yeah, apart from the orchestration and the piano, which is programmed. I know what piano parts I want, but I can´t play the piano very well. I started playing drums before anything and I missed it, so I wanted to see if I still had what it took to record. The video for Kingdom - made possible thanks to fan funding. I usually use a Gibson J-45, which I´ve had since 2004. It´s just gorgeous, it sounds amazing but at the time it really needed to go to the doctor, it was out of tune all the time. My old housemate is a set carpenter for Rihanna, and he met Nuno Bettencourt who gave him a guitar and signed it on the back. On my 29th birthday, my mate gave it to me - he doesn´t play guitar, and he didn´t know quite as much about Nuno and Extreme as I did. We mic´d that up, and though I haven´t used it since that´s what we used to record with. The bass was a Fender Precision that someone lent me, I´m not really a bassist but I knew it wasn´t going to be a showing off album musically, technically in an instruments sense, so the bass just fits the songs. For drums, I used the drummer from InMe´s drum kit - I don´t even know what it is! It´s black, and it´s got cymbals and stuff! You funded the album via Pledge Music - how did that work? We´d already done the album, but I´m only on a small, humble independent label, so if I were only to get funding from them it wouldn´t quite meet my ambitions for the album. I wouldn´t be able to afford the production or the marketing. I got to hire PR and stuff like that which wouldn´t have been possible for me, and it allowed me to invest a bit more, make videos that aren´t done on my phone. It opens doors for me really. I´m in a happy place where I am with my career, but you might as well always dream bigger. It´s not the first time you used Pledge Music though is it? No, we used it for InMe´s last album and I used it for The Hardship Diaries when it wasn´t that well known. I´d seen a few artists I knew of use it. Some things I was sceptical about, and I didn´t know how much people would want to jump on it, but it´s a learning process. For this one, I gave away most of my back catalogue even if someone only pledged £8. Because I´ve recorded so much music over the years, it gave me the opportunity to sell off some rare things, and give people a chance to see videos first. I think sometimes artists don´t embrace it properly or will over charge. You´ve got to put yourself in the listener´s shoes and then make it an experience throughout so they´re not just paying for an album and getting it in three month´s time, they get more. What lessons have you learned since you started using Pledge Music? To manage a to-do list! Mine is intense - I just came back from holiday and had two days before going back on the road, and I got up at 8 and worked thoroughly through trying to tick as many things off as I can, to do it properly. I´ve got strict deadlines, I want to fulfil everything by the end of July and then I won´t go insane! What was it that you offered that got the best response? I think the deluxe edition sold the most. I do personalised songs which did really well, which is quite fun for me. Usually I´ll get information from whoever pledged - usually they´ll want a song for a girlfriend, and they´ll give me some personal stuff to make the song special to them. I think the cool thing to me is how the Pledgers are all in it together as well. So when I do these personalised songs, I always ask if they mind me giving them away to other Pledgers and they always say yes. They all benefit from this little individual Pledges. One other thing I did for this one with my band InMe was exclusive online shows for the Pledgers, and then recording every single InMe song acoustic. It´s nice. It´s better than ‘hey, you´re going to get 12 songs every two years and that´s it´! It must build a real community as well? Yeah, and I´m starting to remember a lot more names than I thought my brain could take! It might get to a point where I need some help, but at the moment people can just email me whenever they want. They might only get a brief reply because I make myself pretty busy, but it´s nice to connect with them. I see myself as a lucky music geek that is lucky enough to have people buy into my music and come to shows. I get to do this full time! I don´t understand why people would ever consider the people that support their music a burden. What advice would you give to bands thinking of funding a release this way? You can make it completely creatively individual. For Dreamoirs we´ve got pillowcases, Dream Tea mugs and coasters, stuff like that. You´ve got to be honest - some artists put things I can see right through, and are massively over charging. Outside of touring, I host acoustic nights and I do weddings and pub gigs and stuff like that, and I charge what I consider to be a very reasonable and fare price taking in my expenses and a little bit on top to live on. But I see some people do the same thing for £10,000! Who the hell has got £10,000 to have someone come and play their party! Dreamoirs is available on iTunes now. You can also pick up a copy on Amazon. Dave McPherson is playing an album launch party at the Barfly, Camden on Thursday 7 June. To be in with a chance to win tickets to the gig, simply email musicradar@futurenet.com with DREAMOIRS in the email subject line, and we´ll put you in a draw. Good luck! For more information, visit the official Dave McPherson website, or visit Facebook.